July « 2011 « Welcome to Property Source Nation! Premier Art Icon Home For Sale…The “Mushroom House”! Donation of up to $100,000 to “Habitat for Humanity” and other charities upon sale! Rich Testa of RE/MAX Advance always has a vision for a property…especially one as unique as the “Mushroom House”! Upon meeting the current owners, Christine & Steve Whitman, and seeing their wonderful architectural gem, the sellers and Rich Testa came up with a unique idea. Considering that the home is part of the Greater Rochester Community, why not donate a portion of the sale to charity! Up to $100,000 of the purchase price of $1,100,000 will be donated to “Habitat for Humanity” and/or other charities based on the sellers and buyers request. Regardless of purchase price, a minimum amount of $10,000 will be donated upon the sale. In addition, Rich Testa Real Estate will donate $1,000 to “Habitat for Humanity” upon the sale of the property. This rare and premier art icon home is such an amazing opportunity for the most discriminating buyer! Commonly referred to as the “Mushroom House”, the architect James H. Johnson actually fashioned this unique dwelling after a stem of Queen Anne’s Lace. The home’s distinctive retro-modern “pod” design earned it a designation as a Town of Perinton Landmark in 1989. In addition, nature is all around you…being adjacent to Powder Mill Park with a beautiful stream and waterfall. In 2001, the current owners commissioned James Johnson, the original architect, to add living space to the structure. The new area is linked to the original house by a tunnel decorated with the original owner’s and creative visionary Marguerite Antell’s hand-painted ceramic tiles! The entrance features a mahogany door and frame designed and built by Wendell Castle. Inside and out, the walls and ceiling are sand-molded and decorated by artists including Marguerite Antell, Annie Dunsky Kalnitz, and Pepsy Kettavong. Additional artists who participated in the new living space are Dan White of Keuka Studios (iron work), Tom Scott, Custom Woodcrafter (custom fine furniture), and Adam Chesis (custom woodworking). The new addition is very much in keeping with the original structure…this creative, artful living sets the stage for ultimate enjoyment and wonder! This is a once in a lifetime opportunity! Two questions dominate the minds of Real Estate Buyers and Sellers. Let’s get them both answered honestly, right now. The billionaire investor that the brightest watch for advice, Warren Buffett, said, “I buy when people are selling and I sell when people are buying.” In Real Estate, at the moment, there are an abundance of homes for sale (people are selling) and a scarcity of Buyers. That means prices are soft which makes it an excellent time to buy for those who are able to finance the purchase of a home. ‘For those who are able to finance,’ regarding mortgage financing most news reporters have this completely wrong. Down payment requirements are still wonderfully low. Interest rates are ridiculously low. Steve Wynn, billionaire Las Vegas casino developer recently (July 19, 2011) commented publicly that insecurities in business are causing people to not make buying decisions. This is great news for people who have the courage and good sense to make buying decisions. Bottom line to Real Estate Buyers is to go talk to a lender or get a lender recommendation from a Real Estate Agent. Find out if you can qualify for a mortgage, if you can buy now. If you can help your son, daughter or someone you love buy now, help them now. The next obvious conclusion is that it must be a bad time to sell since prices are down. In many areas that is completely true; unless the Seller plans to buy. If a person selling wants to buy another home it is a great time to make that move. They may get a lower price for the home they are selling but they will be able to make up for it on their purchase, particularly if they are selling an area whose Real Estate is healthy and moving to an area where Real Estate prices have declined. We (Chava and I) are putting our house on the market this month to do that very thing. This is a historically tremendous time to purchase a home that you may have thought you would never be able to afford. So, is it a good time to sell? No. If a person is not buying and does not have to sell; if they can wait for a few years, wait. Unfortunately, it may be a few more years until most Real Estate markets are healthy again. Then again, as soon as business leaders have the confidence to invest in their businesses and hire again, the market may turn quickly. When that happens, the rise in prices and rates will occur quickly and this ‘moment’ of opportunity will be lost forever. The Real Estate in some towns is healthier than others. It is easy to determine. Walk or drive around to discover two things. Are there a lot of homes for sale and are they selling quickly. Look for for-sale signs. Get online or call the Agent and ask if it is still for sale. In our town (Brighton, New York) most houses are selling very quickly. It is an area with very few foreclosures and short sales. Most of the homeowners do not work at jobs that are transferring them or laying them off. So, in this town most people are not selling. In this town and in some others around the country there are more qualified and motivated Buyers than homes for sale. Houses sell quickly at a very healthy price. Do you have a Real Estate Agent that you trust? If not, find one. Ask them to do this research for you. Provide you with a list of homes for sale in your area, homes recently under contract and sold. Look for the number of homes sold versus for sale. Be specific. Look in your immediate area. You will discover that, with this information, you can quickly and easily determine the health of your market and make your best decisions accordingly. For those of you who understand the opportunities described above, you are realizing that it is also a terrific time to be investing in Real Estate. Whenever gold prices are on the rise, Real Estate prices will be suffering. The reason to buy Real Estate instead of gold is that when the economy recovers gold prices will drop and Real Estate values will rise. This is not guesswork. Do your own research and you will find this to be true. As you think about this, the reasons for it become clear. It couldn’t be more obvious that, if you are in a position to buy a home or sell your present home and buy another or invest in Real Estate, this is the best possible market to make that move. Rich Levin is Real Estate expert. He is a featured speaker across North America. If you would like to ask Rich a question or make a comment, you can contact him at Rich@RichLevin.com or 585-244-2700. Rich is President of Rich Levin’s Success Corps Inc.
Summer is passing us by. The stores are brimming with back to school supplies. All patio furniture has been marked down and purchased for next year. Your flip flops are looking tired and bleached out by the sun. Your honey do list has been done. What now? How about treating yourself, your kidlets, your significant other or a bff to a late summer picnic? Plan a perfect late day or Sunday picnic. In the Rochester and Fingerlakes area, we are blessed with countless spots to enjoy your picnic, especially if you gravitate to the water. Consider the obvious, Charlotte beach by the gazebo and pier, one of the many canal parks of Spencerport, Pittsford and Fairport. Highland Park was planned and planted so something is always in bloom. Try Sodus Point, Fairhaven Beach, or the winding path where Irondequoit Bay meets the lake. Letchworth State Park has many hiking paths to discover as well as a favorite picnic spot of my children, StoneyBrook. Here you relax by natural waterfalls and swim in the Mother Nature made pools. I remember picnicking as a child in Mendon Ponds Park searching for the ominously named “Devils Bath”. Cobbs Hill Park by the reservoir has great views of the city. And for a quirky spot try Mt. Hope Cemetery. Here you can view headstones of famous Rochesterians like Susan B Anthony. Love animals? Treat your kids to a fun day at the Seneca Park Zoo, complete with a packed, sack lunch. Last Sunday, my husband and I picnicked at the public beach at Hammondsport, Keuka Lake. We were entertained by the antique boat show and parade. What delight to see restored wooden and fiberglass boats, strutting their stuff in the afternoon sun. On our ride home, I spotted a Mennonite family enjoying a supper at the Woodville Park at the South end of Canandaigua Lake. Pack appropriately, utensils, ice, mosquito repellent, folding chairs and a large cloth tablecloth. If you hate preparing food, stop by the Dark Horse Café and grab sandwiches, chips and drinks, then go. Bring a book, read to your kids, find rocks to be painted as momentos. Share this time as we forge into fall. Next month it is back to school, back to work, and back to fixing up and decorating our homes. But for now, relax, enjoy your Sunday, and always prepare a plate for the ants. Is Chlorine Safe In Water? Chicago 1908 was when chlorine was first introduced to treat municipal water. It was great; it helped eliminate many bacterial diseases such as cholera and typhoid fever. Since then, most municipalities still have chlorine as their agent of choice to treat the water. Even though there are other methods to the same end, chlorine is cheap and effective. But is it completely safe? In preparation for this article, I read many reports on the effects of chlorine (consumption of, and showering in low level chlorinated water). Yeah! While showering, two things take place. Your skin absorbs chlorine and chlorine vapor is present, therefore you inhale it. The longer the shower, the more you take in. Most articles listed the negative effects from something simple like skin irritations to many forms of cancer. I only found one report that said they had no conclusive results on the long term effects of low level chlorine on your body. Well, since I’m not a doctor or scientist, just Doug the Plumber, I drew my own conclusions. I don’t put a drop of chlorine on my cereal in the morning of remove the cap of the bleach and take a deep breath before starting my day. Let’s face it; chlorine even at low levels can’t be a great thing. So, lets get it out of you house. There are a couple of ways to accomplish this. You could purchase a filter for your shower and faucet. They’ll remove most chlorine and for a short period of time that’s okay. However, you should have one for every faucet or shower in your home. That’s just not practical or inexpensive when you take into consideration you have to purchase replacement cartridges on a regular basis. I would recommend purchasing a whole house backwashing activated carbon filter. This is not a cartridge type filter. They’re not exactly cheap, but they work great. They’ll remove all the chlorine in the whole house, leaving all drinking and bath water completely safe. How much? Depending on your family size and water consumption, professionally installed could run you from $1,500 to $2,500 or a little more. These filters last for years, only needing rebeding once every 12-18 months. This could translate to pennies a day! My conclusion, remove the possible risk today, and you’ll have peace of mind for years. Cracked and missing mortar can lead to damp inside your home so try and deal with the problem before it becomes too serious. Here’s how to tackle small problem areas. You will need a pointing trowel with a 3-4in blade and a wooden handle for comfort. If the entire wall is affected, you may want to call in a professional. Time to complete job: Repointing is a time-consuming job. A square yard patch of wall should take around four hours to rake out and repoint. Remove the old weathered mortar to a depth of about 12mm (0.5in) so that the new mortar will have enough brick area to form a good bond. Chip away any pieces of mortar stuck between the bricks with the cold chisel and club hammer. Old brickwork is usually very absorbent. Spray the bricks and mortar joints with a plant sprayer and cold water. Tip: Always wear goggles and thick gloves when using a cold chisel. Mix up a small batch of mortar mix. A ready-mixed pack is ideal for small areas but it’s cheaper to use cement and sand for larger sections. Use a mix of one part cement to six parts builder’s sand and one part lime. Load some of the mix onto the carrying board and start to push mortar into the vertical joints with the pointing trowel. Next, force more mortar into the horizontal joints. Try to keep the mix away from the brick face to prevent it staining. Tip: Keep the carrying board just underneath the joint to catch mortar that falls as you work. Once the patch has been repointed, test the mortar to see if it is ready for shaping by pressing your thumb into the surface. If the mortar holds a clear print, it’s dry enough to be shaped. Try to match the existing pattern of pointing as much as possible. You can make the pointing flush with the brickwork with the edge of the trowel or a joint strike. Leave the mortar to harden for at least an hour, then brush off any debris from the face of the brickwork. Tip: To make a concave shape to match old pointing, drag a piece of bent metal pipe along the joints – shape all the vertical joints first, then finish with the horizontal pointing. Second Quarter statistics released by the Genesee Region Real Estate Information Services (GENRIS), the information subsidiary of the Greater Rochester Association of REALTORS® (GRAR), show signs of a housing market returning to a more typical rhythm in the 11-county region. The median sale price for the Second Quarter remained flat at $120,000 when compared to last year at this time. Transactions for the Second Quarter 2011 showed a 32 percent decrease over Second Quarter 2010, with 2,371 homes sold, which is very likely due to a more traditional Second Quarter this year matched against one spurred by the Federal Homebuyer Tax Credit last year. Homes listed for sales saw a slight decrease of one percent from a year ago. “This quarter we saw a 32 percent decline in transactions when compared to same time last year, and we attribute that to the Homebuyer Tax Credit contract and initial closing deadlines last year of April 30th and June 30th respectively,” stated Carolyn Stiffler, president of the GRAR Board of Directors. “While looking at the First Quarter stats this year we discovered how much influence the Tax Credit had on sellers, now looking at the Second Quarter’s closings, it is now clear that buyers also heavily took advantage of purchasing a new home in the closing months of the Credit. 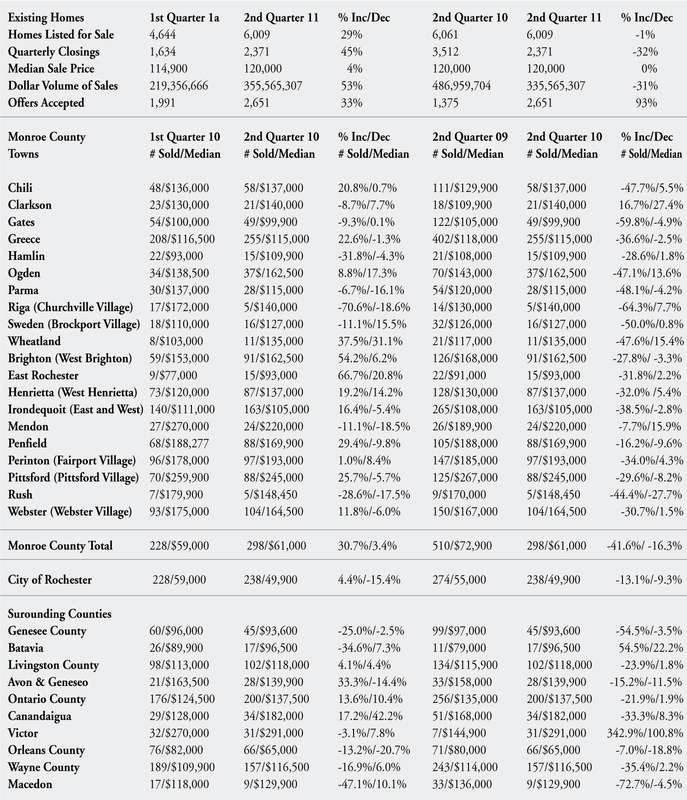 While total sales were down across the area as compared to a Tax Credit market, there were several towns within Monroe County that experienced appreciation in home values this past quarter from the same time a year ago, they include: Chili, Clarkson, East Rochester, Hamlin, Henrietta, Mendon (Honeoye Falls Village), Ogden (Spencerport Village), Perinton (Fairport Village), Riga (Churchville Village), Sweden (Brockport Village), and Wheatland (Mumford & Scottsville Villages). Also, the Town of Victor in Ontario County did exceptionally well realizing substantial increases in both number of sales and in home values over the same timeframe. Broccolo Tree and Lawncare on PSR – Listen Now! House and Coyne invite the experts at Broccolo Tree and Lawn Care to the show. From the emerald ash borer to landscaping tips – tune in Saturday morning from 9-10am on Sportsradio 950AM ESPN. Visit Broccolo Group Website. Most of my articles are directed to Real Estate Agents. This one is directed to the Buyers and Sellers. In fact, if you are an Agent, please stop reading because this may upset you. How does a Buyer or Seller choose a Real Estate Agent that will do the best job for them? Don’t do this. At a picnic this spring someone said this to me, “My Agent didn’t do a very good job but we’ll probably use them again because we don’t know anyone else.” It shocked me. My standards for the people I hire to do jobs for me are much higher than that, particularly when large sums of money are involved. The Agent works hard to determine the market value. Market value is the highest price a Buyer may be willing to pay. Working hard means that they have done their computer research and then gotten in their car and driven by all the comparable properties, making notes to share with you. Then the Agent analyzes that information to recommend to an initial asking price to you. The Agent puts all the information into a form that makes it easy to share with you; so that it is easy for you to understand why the Agent is making their initial asking price recommendation. The Agent should be confident and persuasive about their recommendation but in the final analysis be clear that the decision of what price to ask is up to you, the Seller. The Agent will show you a detailed marketing plan for your property that includes regular weekly updates and a face to face meeting within thirty days if the property is not sold by then. As important as the details of the marketing plan is the Agent’s demonstrating that they are responsive by computer, text, and phone to people inquiring about your property. The Agent is competent to go through your property from top to bottom, front to back making recommendations of improvements and repairs that will add value and make your home sell more quickly. This is particularly important in a softer housing market. The Agent’s marketing plan will include a discussion on how they will represent you through the negotiations, inspections, the Buyer’s mortgage approval process, appraisal, pre-closing walk through and closing. In other words assurance that once an offer is accepted on your home they stay attentive and involved until the proceeds are in your hands. Is it important that the Agent live in the area of your property? Possibly, it is more important that they are competent and hard working as the above items demonstrate. It is completely appropriate to ask the Agent anything including whether they live in the area. On the other hand, always choose competence over familiarity. Review with you all the paperwork involved in purchasing a home in your area and provide you a copy of the paperwork. Review all the options and decisions regarding inspections, attorneys, title companies, lenders, repairs, and completely answer all of your questions. Review, in detail, the process of house hunting, looking at homes, making an offer, negotiating the initial price and terms, completing inspections and negotiating issues that arise from the inspections; the attorney’s role and the current issues that may arise in the mortgage approval process; final inspections and closing process. In other words you want to have every question answered by the Agent, even ones you didn’t know to ask until the Agent raised your awareness. The Agent needs to either review financing options with you or ensure that you have met with a mortgage lender so that you are confident and clear on the type of mortgage, the amount you can borrow, the payments, and the cash needed to complete the purchase. At this initial meeting the Agent will also provide you the required information on Agency. The State requires the Agent to provide an explanation regarding their representation of your interests and the Agent’s relationship with you and other parties in the transaction. The Agent will provide you will a full list of all the homes available in your price range and with the criteria you desire. They will review the information so that you understand unfamiliar abbreviations and Real Estate language. They will then send you by e-mail and mobile the newest properties as soon as they hit the market. They will make appointments for you to see homes that interest you. While showing you the home they will be there for support, make you comfortable to thoroughly look at the home, answer your questions, and alert you to any issues or problems that come to the Agent’s attention. I call it watching your back. When you find a home in which you are interested the Agent will provide information on other homes for sale and sold to give you real data on which to base the price you will offer. This information becomes less necessary when you have seen many homes in the area, since you already have this data first hand. The Agent must be responsive to you when you need them or have another Agent available to help if and when they are not available. How does a Buyer or Seller choose an Agent with this level of competence? Whether they are a friend, referred to you, contacted at an open house, over the internet, or you walk into their office, review the above criteria and ask how the Agent works. Listen and ask questions to discover whether providing the level of service described here is their normal way of doing business. Warning: do not simply take another person’s recommendation. Take the recommendation but still look for the level of service and attention described here. It is a high standard. In fact it is an unexpected standard. So, even your best intentioned friends my not judge by this standard. When you find that Agent, that measures up to this standard you will have found a professional that will be valuable to you for as long as you live in the community. Rich Levin is a National coach and featured speaker to Real Estate Agents. His Clients are often the most productive and most respected because of their high standards of performance. Rich is President of Rich Levin’s Success Corps Inc. You can contact him at Rich@RichLevin.com or 585-244-2700. It’s the beginning of summer, but the effects of rising fuel costs are on the minds of many legislators from Buffalo to Albany. One report estimates homeowners could spend 30% to 75% more than they did last year to heat their homes this winter. The New York State Energy Research and Development Authority (NYSERDA) reports that home heating oil prices in Western New York are up 75% from this time last year. Kerosene is up 67.5% and natural gas is up 15% from 2007 prices. Those figures worry Gerard Eberhardt of Henrietta, especially when he looks at a $464 August utility bill, mostly for electricity costs. “I can just imagine what my winter bill is going to be next winter,” Eberhardt said. Energy Star contractors like Mike Murphy, the owner of Home Comfort, are encouraging homeowners to plan ahead. That money is offered through the state’s Energy Star program that will allow homeowners to invest in substantial energy-efficient upgrades such as air sealing, insulation, and instant water heaters. Although costly, those improvements can pay for themselves within a few years. The State Assembly’s Energy Committee plans to push for legislation that will offer more assistance to homeowners. Some of that assistance, such as the Heat Energy Assistance Program (HEAP) is income-based, but many energy star improvements that save money also come with state aid.